The New England School of Metalwork is a full 501 C3 non-profit educational facility devoted to the promotion and strengthening of metalworking skills. 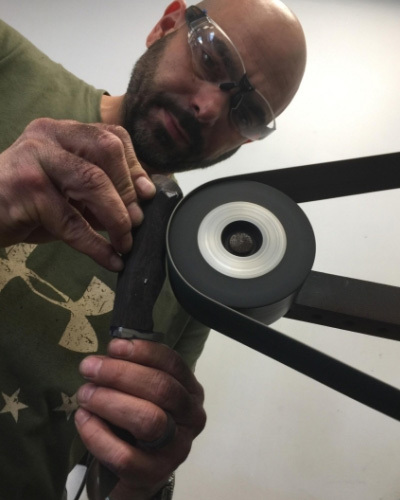 Started in 2000 and located in Auburn, Maine, the concept of the school was developed by Maine Oxy, a local welding distributor and Dereck Glaser, a local artisan Metalsmith. After several years of individuals inquiring about welding skills and ornamental metalwork instruction the decision was made to build the school. We set to the task of designing and planning a dual purpose facility for Metalsmithing and welding. The New England School of Metalwork offers a unique Metalsmithing program found nowhere else. A professional combination of both traditional and contemporary tooling, techniques and instruction. No where else will you find the attention to the important details. The studios are designed, run and maintained by professional Metalsmiths. The diverse array of instructors from around the country provide students with many options and many disciplines of metalworking. We offer a full year round selection of specialty workshops and various programs in Blacksmithing and Bladesmithing as well as featured demonstrations and symposiums. 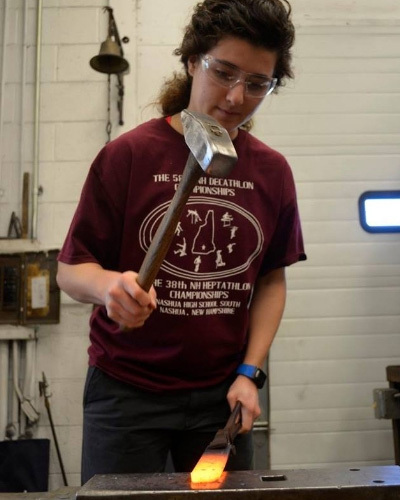 The Metalsmithing studio at the New England School of Metalwork has been designed to integrate both traditional and contemporary practices where we run both a Blacksmithing and Bladesmithing program. With full quantities of hand tools and equipment to accommodate up to eight students, each of the eight forging stations having both coal and gas forges, vise and anvil. Only a few steps away in any direction students will find treadle hammers and two pneumatic power hammers, hydraulic forging press, post vises, belt grinders and racks of hand tools. Our ever growing assortment of traditional hand and power tools provide students with the tooling required for many processes. The diverse array of nationally known instructors provide students with many options and many disciplines of artistic metalwork. 2019 Course offerings are now open ! 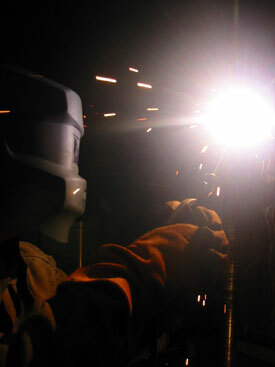 The NESM Welding Program offers training in SMAW, GMAW, GTAW, and FCAW on a variety of materials. Oxy-fuel and plasma arc cutting as well as carbon arc gouging are also taught at the school. Classes never exceed twelve students. We teach students both the technical and hands on sides of welding. The more a student understands what is involved with a particular welding process the better welder he or she will become. Students learn about process theory and technique, electrode classification and use, gas selection, and troubleshooting. Hands- on practice is designed to improve a student’s skill in producing welds of a consistent size and appearance on different materials. 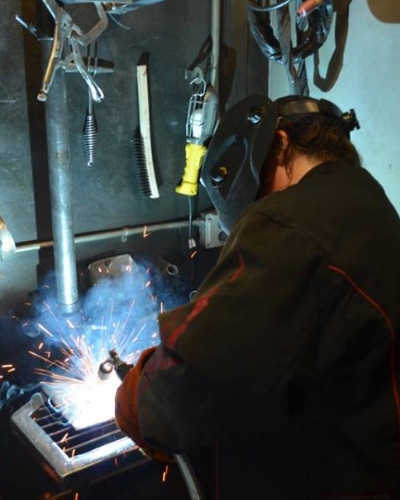 One of the welding program’s greatest strengths is its flexibility. We have basic and advanced courses in several processes. In addition, we can present specialized classes to individuals and companies with very little advance notice. Training may run from a one-day seminar to several days or weeks of intense instruction. We have an outstanding facility with up to date equipment. The school’s instructors have years in the trade and are skilled at teaching all aspects of welding. Our goal is for the student to understand the welding process and to consistently produce strong, good-looking welds with the least amount of effort. The New England School of Metalwork is a 501 C3 nonprofit educational facility dedicated to creating the most comfortable and motivating atmosphere possible for students to absorb knowledge in order to obtain mastery of their craft. We strive to expose students to the widest variety of processes through a diverse selection of instructors. We pride ourselves in offering students and instructors the broadest range of tooling and equipment possible. We feel that the more craftsmen are educated in their field, the more efficiently and safely they can work. This raises the level of productivity as well as the quality of the work, thus offering the public a better service with a higher profitability to the craftsman. The New England School of Metalwork has nearly 75% of its courses approved for VA benefit. You can use your VA benefit for Blacksmithing, Bladesmithing or Welding, call or email us for further information.